Konon Molodi, the son of a scientist, was born in Russia in 1923. He emigrated to the United States in 1933 where he changed his name to Gordon Lonsdale. He was educated in California but on the outbreak of the Second World War he returned to the Soviet Union and served in the Red Army. After the war Lonsdale once again went to live in America. By this time he had become a KGB intelligence officer. In 1955 he moved to England where he worked as a company director. While living in England he established a spy ring that included Harry Houghton, Peter Kroger and Helen Kroger. Over the next few years obtained a great deal of information on nuclear submarines and the location of secret military bases. 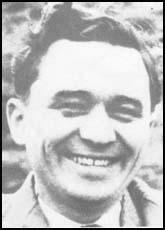 In 1959 Michael Goleniewski, a Polish intelligence officer, told the CIA that two Soviet agents were operating in Britain. Goleniewski was also able to identify one of these agents as working at the Underwater Weapons Establishment in Portland. This information was passed on to MI5 and eventually came to the conclusion that this agent was Harry Houghton. By following Houghton the intelligence officers were able to discover about the activities of Lonsdale and the Krogers. Lonsdale and his fellow conspirators were arrested on 7th January 1961. Lonsdale was sentenced to fifteen years in prison. In April 1964 Lonsdale was was released in exchange for Greville Wynne. Gordon Lonsdale went to live in the Soviet Union but died in strange circumstances in Moscow on 14th October 1970.